Shake with ice, strain into a cocktail coupe, and garnish with a lime twist. Two Mondays ago, Andrea and I ventured down to the South End to have dinner at Estragon. For a first drink, I selected a mezcal equal parter from Sahil Mehta's drink note book. 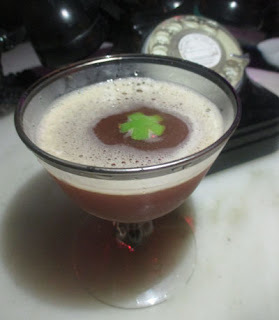 The combination reminded me of a mezcal Blood & Sand with hints of the Last Word as well. For a name, I dubbed this the Estocada after the final strike from the matador that kills the bull. Once served, the Estocada shared smoky aromas from the combination of mezcal and Zucca's Chinese rhubarb root. Next, lime and dark fruit on the sip was followed by smoke and bitter herbal flavors on the swallow. Overall, the combination of Cherry Heering and Zucca worked rather well as Zucca has done with fruit notes such as strawberry in King Vittorio's Cobbler and black currant in the Dissenter.